Buy view shown here actual size. 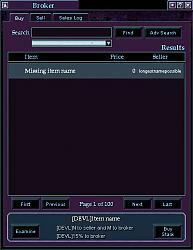 This add-on is an alternate version of the standard FetishMarket window, ideal for users with smaller screens. It uses the standard popup scheme for advanced searches and tabs to switch between Buy/Sell/Log views. The entire window stretches virtically and horizontally. 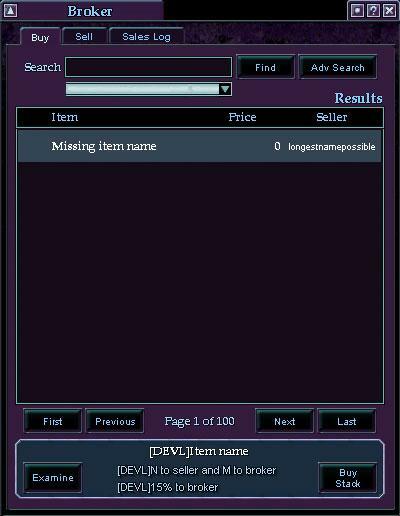 Select any item in the sell view and click the "Browse Market" button to find items of the same name. This add-on should work with FetishClassic, though some colors may need to be manually edited from blue to gold.